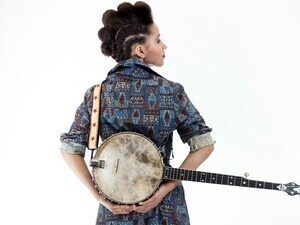 CES at Frostburg State University will launch its 62nd annual season with Afro-Canadian bluegrass phenomenon Kaia Kater on Saturday, Sept. 15, at 7:30 p.m. at the historic Palace Theatre at 31 E. Main St. in Frostburg. The performance is offered as the capstone concert for the 13th annual FSU Appalachian Festival. Included within “Rolling Stone” magazine’s list of “10 New Country Artists You Need to Know,” Kater plays folk mountain music with a modern-day edge. Her songs are fueled by her rich, low tenor vocals, jazz-influenced instrumentation and beautifully understated banjo. Orlando Weekly declared that Kater is “defining roots music for a new generation.” Her keen traditional sensibility and lyrical ability distinguish her as an artist on the rise and helped earn her a 2016 Canadian Folk Music Award. Also performing are folk duo Anna & Elizabeth, who bring traditional songs to life with sparse, atmospheric arrangements of guitar, banjo, fiddle and the uncanny blend of their voices in close harmony. They revive the tradition of “crankies” – illustrated, hand-cranked scrolls that depict songs and stories as they are performed. Prior to the evening’s performance, Kater will present a free workshop, “Hambone and Body Percussion,” at 4 p.m. in the Upper Quad during Appalachian Festival daytime activities. Participants will explore different body rhythms native to the southern United States, with a focus on African-American hambone traditions. The workshop is open to all ages and no instruments are required. Capstone concert tickets are $18 for adults and $16.20 for youth under 18. Member, military and group discount rates are also available. For more information or to order tickets, visit CES’ webpage at ces.frostburg.edu or contact the CES box office at 1-866-849-9237 or 301-687-3137.The box office, located in the FSU Lane University Center, is open Monday through Friday from 10 a.m. to 4 p.m.